I try my best to test many recipes that I have ^^, well even I try so hard there are a lot of cookbook that I never had a chance to use it. I know that chance depends on me because I bake as a hobby, but sometimes I'm just too lazy to do anything, haha. Like this book , that I was so happy to have it but I keep it waited for almost 5 months until I ready to try the first recipe, -*-. 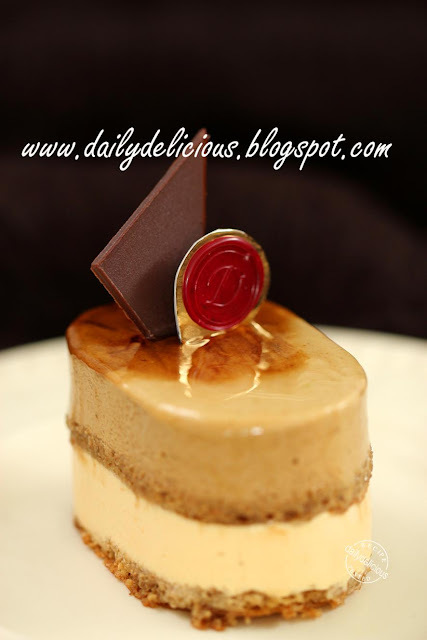 The recipe that I made was the "Brésilienne", it contains coffee mousse, caramel mousse and coffee joconde biscuit. I made this one as an order from my sister, I handed her a book and told her to choose the one that she wanted to eat. I do this trick lately, hehe, because I have a chance to test the recipe from the book (that I want to try) with someone ready to eat it too. The "Brésilienne" means Brazilian, I think that it means Brazilian coffee (because it's famous) but unfortunately I don't have it, haha. So I use very simple coffee that I have, I don't know that I can call my entremets "Brésilienne" or not, ^^, hehe. At first I think that there is a problem with the coffee mousse, it is quite bitter if eating it alone. 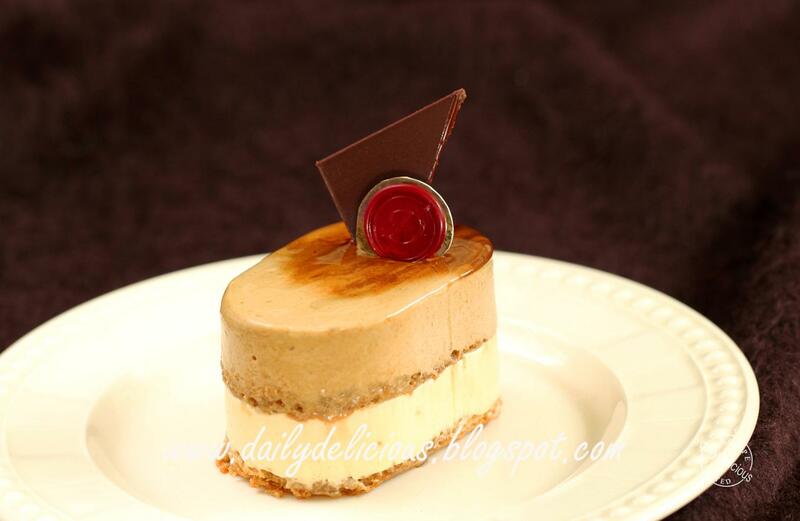 But the taste changes when eating with caramel mousse, both of them smooth and creamy and not too sweet. So I think that this entremets is not for children (my niece didn't eat the coffee mousse at all, but she enjoyed the caramel part). For grown-up like my mom, she really loves it. She said that she prefers the sweet that I made using the recipe from Japanese baking book than western one. I believe both of them are good, it depends on the recipe that we choose and the taste that we like. Like this one, if you love intense coffee taste and not too sweet dessert, you will enjoy it. * Line the sheet pan with plastic sheet, and place the ring molds onto it. Mix the simple syrup and cognac together. Sift the flour and instant coffee granule together. Line the pan with baking paper. Put the T.P.T. (almond powder and icing sugar) together in a medium bowl. 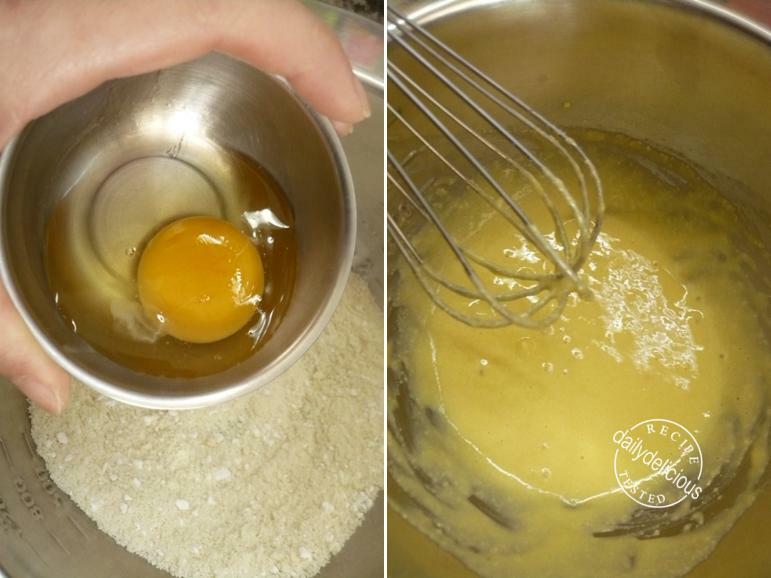 Pour the egg (egg whites and yolks) into the bowl and beat until light. Whip the egg white and sugar to make the meringue. Fold 1/2 of the meringue into the T.P.T. mixture, fold the flour mixture. 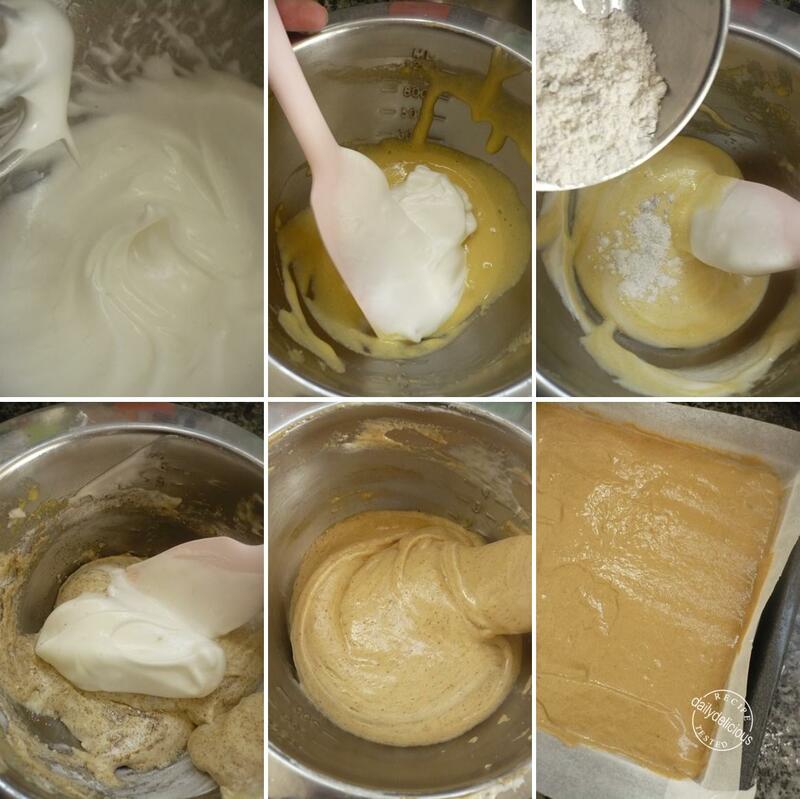 Fold in the rest of the meringue until combine and pour the batter into the prepared pan. Bake for 7 minutes, or until spring back when touch lightly. Let the biscuit cool completely, and cut into desired size, and slice each one into 5mm thin. Whisk the egg yolks, sugar and instant coffee together in a small saucepan, boil the milk and slowly whisk it into the egg yolk mixture. Put the saucepan over low heat, stir all the time and heat until 82°C. Take the pan off the heat and stir in the gelatin, stir until melt. Let it cool completely and mix in the cognac. Whip the whipping cream until soft peak form. Fold 1/3 of the whipped cream into the Crème anglaise au café. Pour the mixture back into the whipped cream bowl and fold until combine. Pipe the mousse into the ring and place the biscuit on top, sprinkle with syrup. 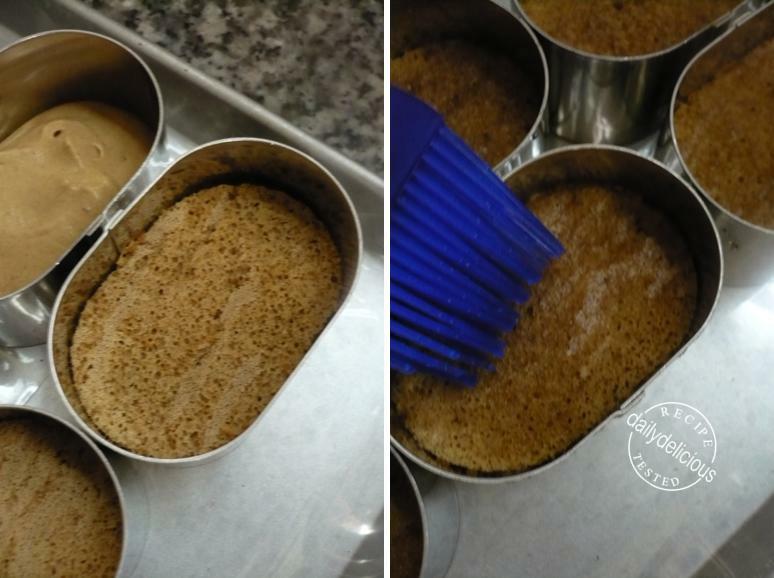 Put the 125g of cream and vanilla paste in a second small saucepan, and heat until warm (or put in the microwave proved measuring cup, put the cup in the microwave and heat for 1 minutes). Put the sugar and corn syrup into a saucepan, place over medium heat and stir occasionally so that the sugar melts and caramelizes evenly. 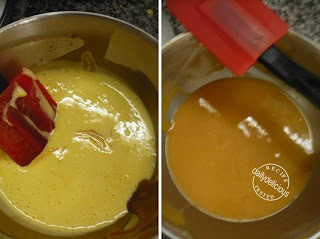 Add cream to the caramel at arm’s length, averting your face—the caramel will boil up and may splatter out of the pan. Stir over low heat until smooth. Take the pan off the heat and stir in the gelatin. 2. When the syrup temperature reaches 100 °C start beating the egg yolk. 4. Continue beating until completely cold. Pour the Pâte à bombe into the caramel and stir until combine. Let it cool completely and stir in the cognac. Fold 1/3 of the whipped cream into the caramel mixture. Pipe into the mold and place the biscuit on top and sprinkle with syrup. Reverse the mold and brush with coffee extract. Cover the top with nappage and, take the cake out off the molds. 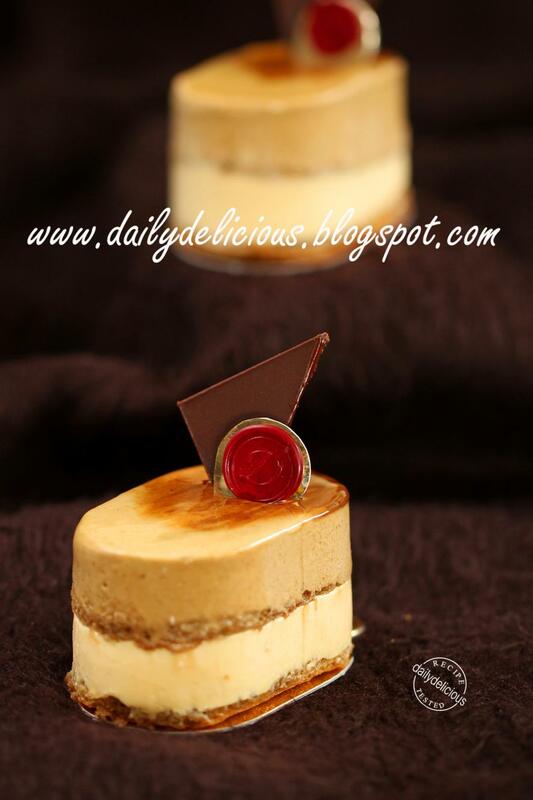 Mindblowing, elegant and quite addictive entremets. WOW! So beautiful and I would love to have this delicious cake with a cup of nice coffee. So beautiful & looks delicious too! I like your idea of passing your book to your sis & letting her choose a recipe.....i should do that too! Coincidentally, on my last blog post, i rambled about my under-utilized collection of baking/cooking books! Thank you, haha, you're the same as me ^^. Thank you, oh it'll be great! Haha, I know many people can't stop buying cookbooks !!!!!!!! You have a great collection too, I saw it. Thank you, ^^, I really appreciate your compliment, haha, I'm happy when my reader're happy too. Wow, what a gorgeous cake. May I know how did you make the logo with initial D? Looks very professional. It's a sealing wax that I use with my brass seal. Oh, I know that many people have that problem, I learn Japanese because I want to be able to read it, haha. So, it's my pleasure, ^^. Hi Pook, It looks so delicious !!! Nice pix too. Is it complecated to make it? I see lots of step. OH wow! I can't believe I'd missed this post! I love the mould. Any idea where I would be able to get them online? I try to find it for you but just can't find it. I bought them from bakery supply shop in Thailand. Thanks a lot Pook! Will get the details from you when I'm heading down to Bangkok. Hope all the water recedes soon! Will probably need a lot of your help with directions about shops on baking supplies in bangkok. Thanks in advance! Khor pun krap! Hi, I made this cake and it was so good! My family doesn't like desserts that are too sweet and this is perfect. The top layer is quite bitter when ate by itself, but it paired really well with the bottom layer. I didn't have these individual molds so I used my 6 in removable bottom pan. 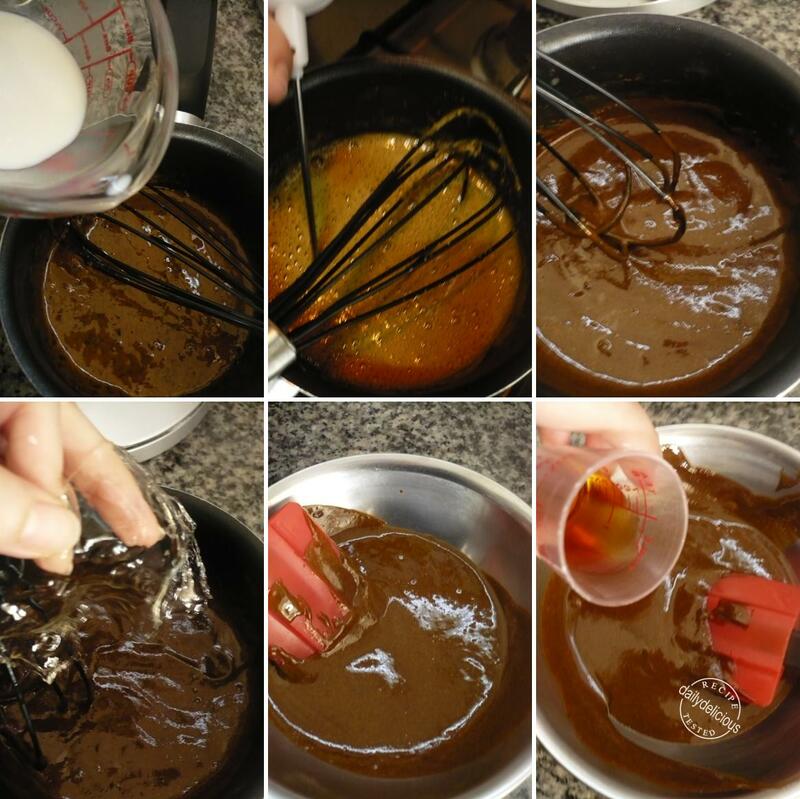 My caramel mousse is darker than your's. (I might have cooked the caramel longer) Anyway, thank you for sharing the recipes. I love your blog, especially the stunning pictures. I learned a lot about entremets making from reading your blog. I want to make more entrmets in the future since they're the perfect size to serve, so elegant to look at, and of course indulgent for the taste buds. I really want to buy those half sphere silicone mold for entremets. I know that different recipes requires different sizes of mold, but can you recommend a size that's used more frequently? I'm so jealous of you for having so many tools, it is hard to find tools in NY. Even if when I do find them since I'm still in high school without a job. Hope you are not annoyed by my long comments, and I look forward to your reply. Sorry for answering so late. About the molds that you want to buy, I think you mean the one that use for cake not for the insert, right? So, I recommend 7x 3.5cm one, it's the perfect size for one serving. Thanks dailydelicious for posting the recipe! I made this for my mom's birthday in a 8 inch round ring, and it turned out beautiful! I topped it with some almond tuilles, brushed coffee, and glazed it just as the recipe. The flavours were amazingly balanced, so props to Sugino for creating yet another beautiful entremet. I live in Portugal, and I can't find corn syrup. Can it be replaced by something else? or simply, put more sugar? Thank you for sharing all these Wonderful recipes (that's more art to me !!). I read you from Portugal, thank you for sharing all these recipes. You are more an artist to me than a simple cook !! About the caramel for the "bresilienne", how can I replace the corn syrup? I can't find it here in Portugal! You can use glucose syrup instead of corn syrup. I love your blog and I find it really interesting! Thank you so much for sharing the recipe I am really thankful! The entremets look absolutely gorgeous!I was wondering can you please share more Hidemi Sugino entremets from Le goût authentique retrouvé? For the Biscuit joconde sans beurre au café in Brésilienne you forgot to add 2g Instant coffee granule for the directions. 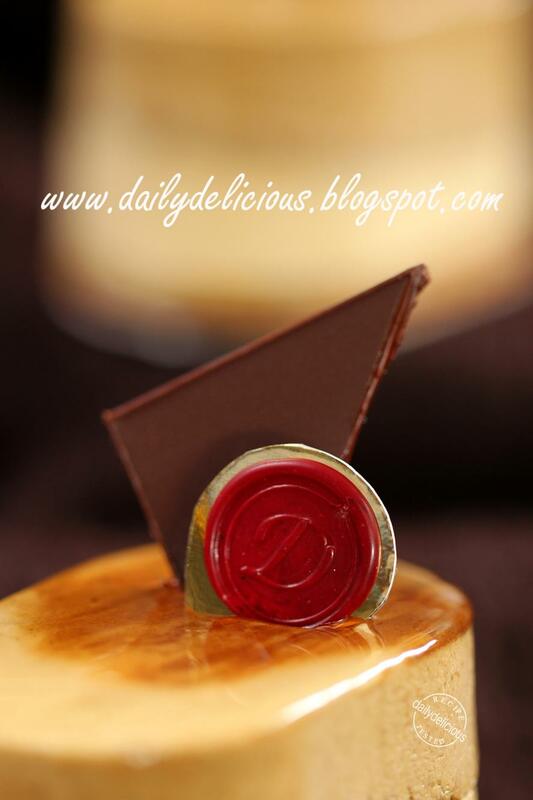 Thank you so much for sharing this recipe the Brésilienne: Coffee and Caramel Entremets from Hidemi Sugino's look so delicious! I was wondering how to convert gelatin sheets to powder gelatin because where I live don't sell gelatin sheet? If your recipe call for 4g gelatin leafs/sheet and 2g gelatin leafs/sheet how do you covert it to power gelatin? And how many milliliter of water do you need to soak the gelatin power? You can use gelatine powder instead of sheet. You will need 12g of water for 4g of gelatine powder, and 6g of water for 2g of gelatine powder. Thank you so much for replying my question I really appreciate! I was wondering how do you know how to convert gelatin sheets\leafs to powder gelatin for any recipe and how do you know how many milliliter of water you need to soak the gelatin power? Let say there a recipe that ask for 5g of gelatin sheets/leafs and I only have power gelatin how do you know how to convert it to power gelatin and how do you know how many milliliter of water do you need to soak the gelatin power? For most of the recipe you can you equal weight of the powder gelatine for the sheet one. You will need 3 times the weight of gelatine (ex: 5g of gelatine will need 15g of water for blooming). Can I use meringue powder instead of egg whites????? If so, can please tell me much I have to take?? The measurements??? Also I don't have Cognac . Is there any substitute for that??? Or is that okay if I omit that ingredient?? Mix 2 teaspoons of meringue powder with 2 tablespoons of warm water then weight it. And you can omit the Cognac ^^. Yes, you can use candy thermometer. Pistachio Macarons: To you my sister!